HMA pavements are flexible pavements. Flexible pavements are so named because the total pavement structure deflects, or flexes, under loading. A flexible pavement structure is typically composed of several layers of material each of which receives the loads from the above layer, spreads them out, then passes them on to the layer below. Thus, the further down in the pavement structure a particular layer is, the less load (in terms of force per area) it must carry (see Figure 1). Figure 1. Flexible pavement load distribution. Surface Course. The layer in contact with traffic loads. It provides characteristics such as friction, smoothness, noise control, rut resistance and drainage. In addition, it prevents entrance of surface water into the underlying base, subbase and subgrade (NAPA, 2001). This top structural layer of material is sometimes subdivided into two layers: the wearing course (top) and binder course (bottom). Surface courses are most often constructed out of HMA. Base Course. The layer immediately beneath the surface course. It provides additional load distribution and contributes to drainage. Base courses are usually constructed out of crushed aggregate or HMA. 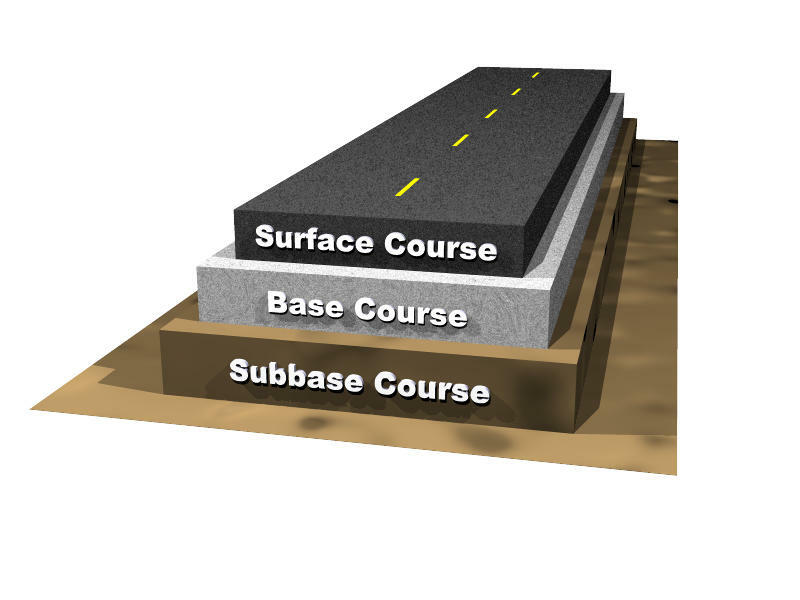 Subbase Course. The layer between the base course and subgrade. It functions primarily as structural support but it can also minimize the intrusion of fines from the subgrade into the pavement structure and improve drainage. The subbase generally consists of lower quality materials than the base course but better than the subgrade soils. A subbase course is not always needed or used. Subbase courses are generally constructed out of crushed aggregate or engineered fill.